As a hair obsessionist, it is my public duty to pass on common knowledge of the beauty pros. Today’s fad-fact may come as a shock to some of those who are in two-tone love with the trend that took the world by storm: Ombré is out. Let’s take a peek at the last few years of repeat ombré representatives. So where does the trend evolve to from here? Luckily, we’re on the cusp of a much-needed summer—meaning, we’re all ready for a little more brightness. Try the age-old technique of Balayage, or hand-painting, to create highlights that start closer to the scalp. Balayage is a French verb that means “to sweep.” Lightening products are used for this highlighting service sans foil. The lightener is painted freehand onto the hair to create a soft illusive highlight. No stripes or odd lines here! This painting technique is fantastic for creating the “I just spent a week at the beach” type of hair. This week I worked with Ashley Kilcher, owner of the newest North Loop boutique, Roe Wolfe. Ashley is a fashion and beauty maven, always looking toward the horizon of trend. It was only natural that her hair be as fabulous as she. 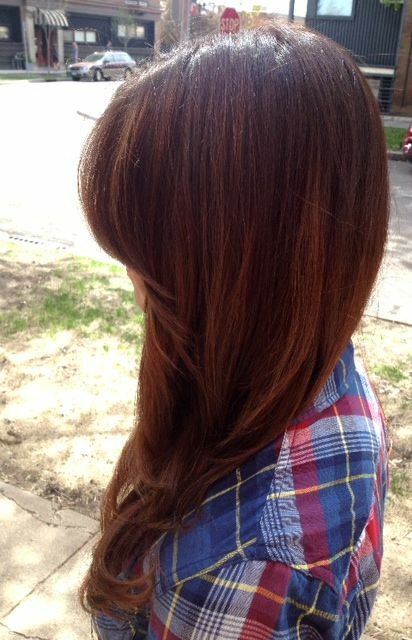 I created a deep sorrel-brown base color with painted highlights of rosewood and amber. Her look still has a gorgeous melting color effect with a lot less ombré!